Conditioned F&D Core 141 The character removes ■ per rank of Conditioned from his Athletics and Coordination checks. He reduces the damage and strain suffered from falling by 1 per rank of Coordination. Grit F&D Core 144 Each rank of Grit increases a character’s strain threshold by 1. Parry F&D Core 149 When the character suffers a hit from a Brawl, Melee, or Lightsaber combat check, after damage is calculated (but before soak is applied, so immediately after step 3 of Perform a Combat Check, page 210), the character may take a Parry incidental. He suffers 3 strain and reduces the damage dealt by that hit by a number equal to 2 plus his ranks in Parry. This talent may only be used once per hit and when the character is wielding a Lightsaber or Melee weapon. Physician F&D Core 149 When this character makes a Medicine check to help a character heal wounds, the target heals one additional strain per rank of Physician. Rapid Recovery F&D Core 150 When the character recovers strain after an encounter has concluded, he recovers one additional strain per rank in Rapid Recovery. Reflect F&D Core 150 Force talent. When the character suffers a hit from a Ranged (Light), Ranged (Heavy), or Gunnery combat check, and after damage is calculated (but before soak is applied, so immediately after step 3 of Perform a Combat Check, page 210), he may take the Reflect incidental. Fie suffers 3 strain and reduces the damage dealt by that hit by a number equal to 2 plus his ranks in Reflect. This talent may only be used once per hit and when the character is wielding a Lightsaber weapon. Shien Technique F&D Core 151 Force talent. When making a Lightsaber skill check, the character may use Cunning instead of Brawn. Side Step F&D Core 151 Once per round on the character's turn, the character may perform a Side Step maneuver to try to avoid incoming ranged attacks. He then suffers a number of strain no greater than his ranks in Side Step. Until the start of the character’s next turn, upgrade the difficulty of all ranged combat checks targeting the character a number of times equal to the strain suffered by the character. Street Smarts F&D Core 152 The character removes ■ per rank of Street Smarts from his Streetwise and Knowledge (Underworld) checks. Surgeon F&D Core 153 When this character makes a Medicine check to help a character heal wounds, the target heals 1 additional wound per rank of Surgeon. Toughened F&D Core 153 The character increases his wound threshold by 2 per rank of Toughened. Trickery is an important part of many Force users’ arsenals, letting them tip the scales of battle in their favor or even avoid some conflicts entirely. Force users versed in shrouding techniques often walk unseen amidst their foes—a particularly useful ability for any Force-sensitive hiding from the Empire. Especially skilled crafters of illusions can even project visions onto those around them, baffling pursuers or terrifying enemies with horrific phantasms. The user may spend 1 Force point to deceive the senses of a living target at short range or closer. The target does not perceive one object or being of silhouette 1 or lower that is within his line of sight until the beginning of the Force user’s next turn. The user may not activate this multiple times. The Force user casts out with his mind’s eye, searching for something lost, concealed, or forgotten. While countless different Force traditions across the galaxy have attached different practices and techniques to this power, from tribal cultures that use it to hunt prey-beasts to orders of assassins who seek out any who defy their orthodoxy, the basic ability remains the same: those who follow pathways of the Force can track down anything or anyone, regardless of the distance or eons that separate them from their quarry. The user may spend 2 Force points to gain insight into the general location or direction of a person or object that he knows about, regardless of its current distance from him. The user may not activate this multiple times. The user may make an Average Vigilance check with the power check to see through all sensory misdirections confronting him, whether these come from technology or more esoteric sources. This power works against tricks such as cloaking fields, holograms, Force illusions, and even physical disguises, at the GM’s discretion, but has no direct effect on spoken or written lies. To successfully see past the deception, the character must spend 1 Force point to activate the power and must succeed on the Average Vigilance check (or opposed Vigilance versus Discipline check if illusions are being created by another Force user). If the user succeeds, his supernatural senses pierce the falsehoods, letting him perceive the truth they conceal. 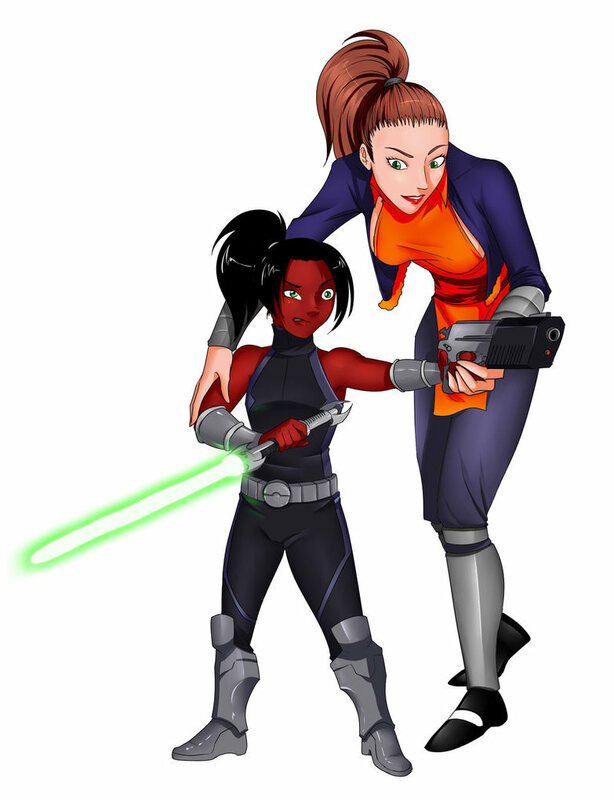 Kassey was born on the Outer Rim world of Lianna Metro. The oldest child of Bruc Smitty, a combat engineer, and Mey'Nai LeHane, a famed fighter pilot. At her mother's insistence Kassey and her two sisters were given their maternal surname, whilst her brother, the youngest of her siblings, shares his father's surname. Justice: In a galaxy full of wrongdoing, justice must be done. The character seeks to bring justice to those who deserve it, while helping victims of injustice to right the wrongs done to them. Emotional Strength: Justice - The character strives for just and deliberate actions in his life, and in his interactions with others. He attempts to make the objectively right choice every time, knowing that justice is more likely to guarantee positive outcomes than sympathy or other emotional displays. Emotional Weakness: Hatred - The galaxy can be a cruel and heartless place, and compassion can quickly turn to hatred of the individuals or situations that cause others to suffer. When a character’s mind roils with simmering hatred, that hatred may be all too slow to fade. Standing at about 5'7", with a weight that fluctuates, Kassey has always stood out with her high ponytail of long maroon hair and signature orange (or sometimes dark red) tabard. Kassey usually wears a tailored navy blue or dark green outfit consisting of a jacket, pants and custom armored boots.